Robert Patch brought his shiny new JTR loudspeakers up to my place today for me to put them through their paces and get his system firing on all cylinders. He bought a pair of JTR Triple 12 tops, and a pair of Orbit Shifter subs. Tops were being powered with a Crown IT4000. Subs were being powered with a Crown IT6000. First up, the Triple 12. All measurements were taken ground plane, outdoors. The Orange trace is the raw response with no processing. 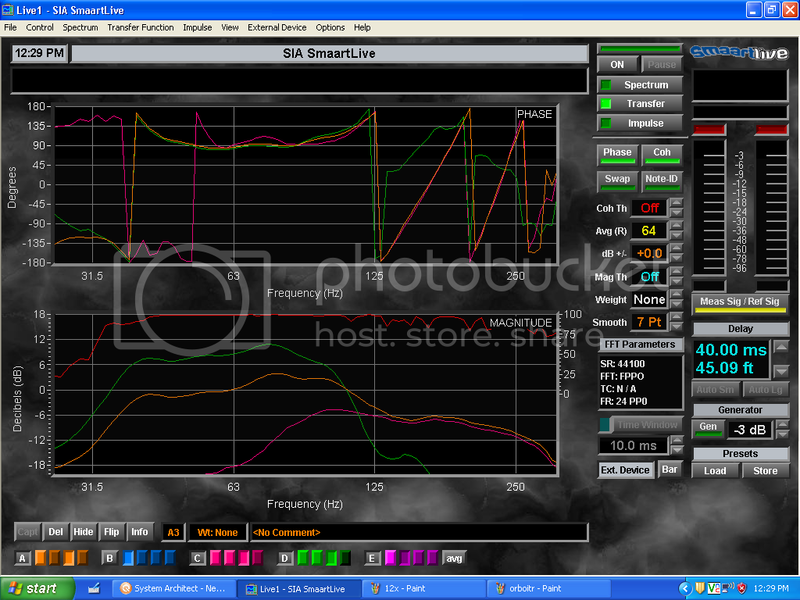 The blue trace is the response with an added 24dB LR HPF filter at 80hz. The Purple trace is with EQ applied. The Triple 12 seems to roll off fast about 8k, and has a weird dip around 300hz, but is otherwise pretty flat. 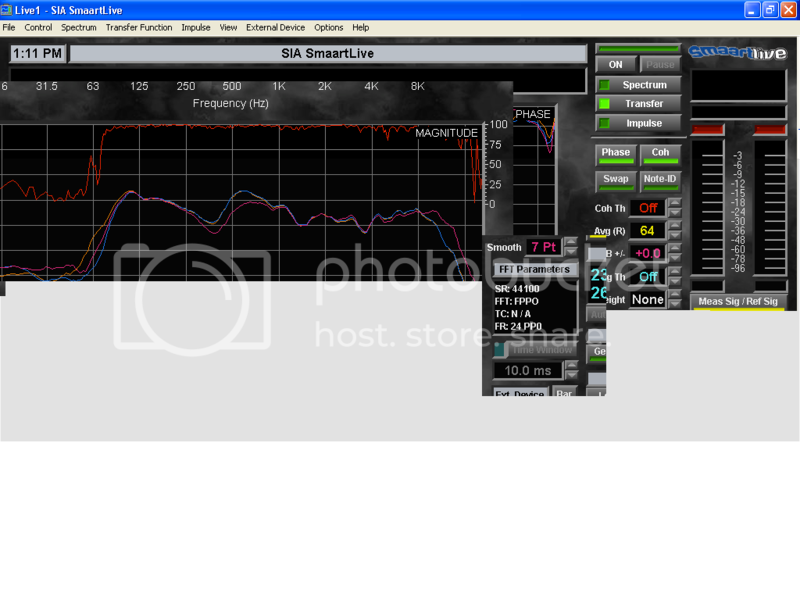 I ended up using 4 EQ filters total. Nothing too crazy. The box still seems to struggles past 12k, but it's not terrible. The Triple 12 has an interesting sound to it. I say interesting, because it's not like what I'm used to hearing. It's not in your face, it's not harsh and it's not what I'd call super smooth. It seemed to have a boxy low mid sound and missing midrange. The top end is crispy, but not super Hi-Fi. Everything is there, it's just, different. 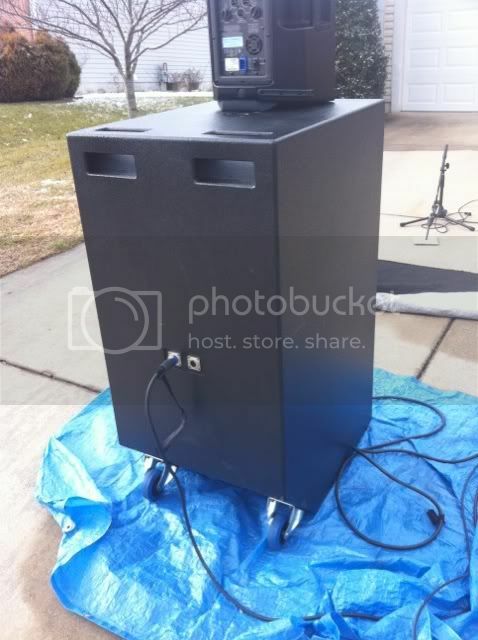 I feel these cabs would work well for acoustic type music, not so much rock and roll. When cranked the HF starts to break up. The 1" compression driver simply doesn't keep up with the rest of the box. You either have to dial the HF back and lose that extension, or simply not turn them up as loud. The cabinets do stay pretty clean and pretty smooth as you crank them up, but the HF struggles as you approach limit on the IT4000. Overall, they're not bad cabinets at all. They're better sounding then some offerings. If I really spent a few days and gigs with them, I could probably get them pretty rockin', but it would take some work. 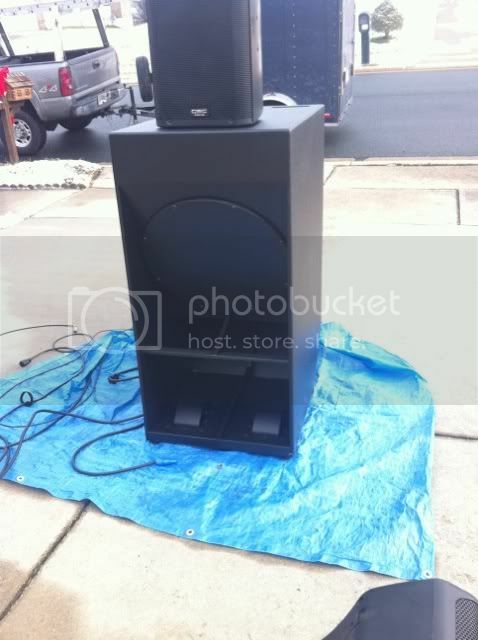 I'd rather have a JBL SRX or EV QRx if I was spending the $$. The Orbit Shifter is a single 18" horn loaded subwoofer. It has 2 handles on the bottom, and 2 handle cutouts on the rear. It tilts back onto wheels and is pretty easy to move around with one person. 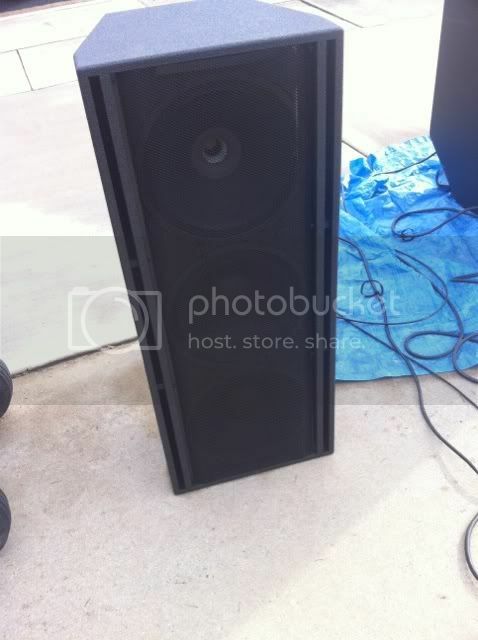 They're very similar in size to a JBL SRX728/Danley TH115. However, it just SCREAMS DJ grade to me. It needs a full faced grill. It just looks ridiculous to me. The purple trace is the raw response. 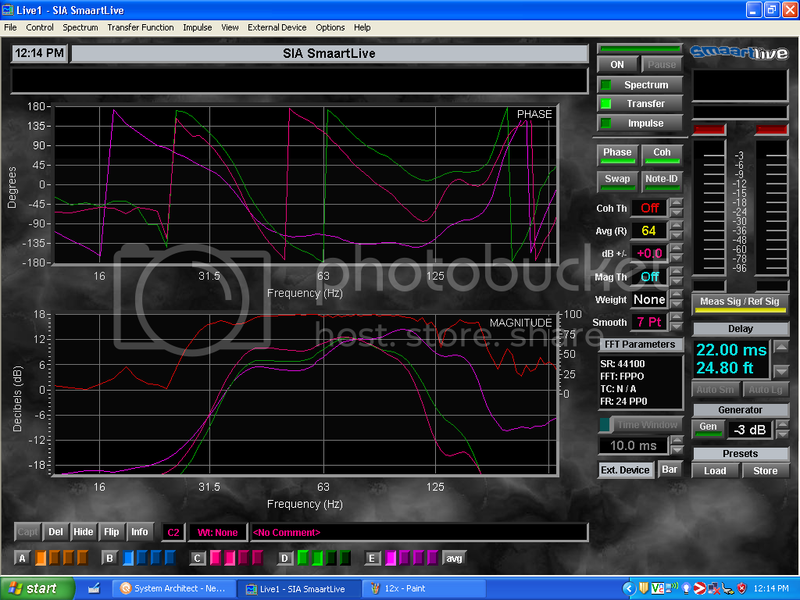 The green trace is with a 24dB LR LPF @ 80hz, and an 18dB BW HPF @ 35hz. The pink trace is final with EQ. A single Orbit Shifter does very well from 40hz - 80hz. Due to it's horn loaded nature it does get very efficient above 80hz, and it required a few out of band EQ cuts to smooth it out. When combined with the Triple 12, the system plays very well together. A single Orbit Shifter is not bad at all. It reminds me of the Growler tonality. It's not boomy, but not super tight either. It's very smooth throughout it's bandpass and does very well with dance music. It bangs out the low notes just fine. I was able to bottom it out with some dance tracks, before the IT6000 hit limit. A single Orbit Shifter does seem to have more output than a pair of Growlers. They'd be a good alternative to everyone's favorite MI dual 18's. Overall, they're good subs. I'd never buy one just because of the way they look, and it's a shame. 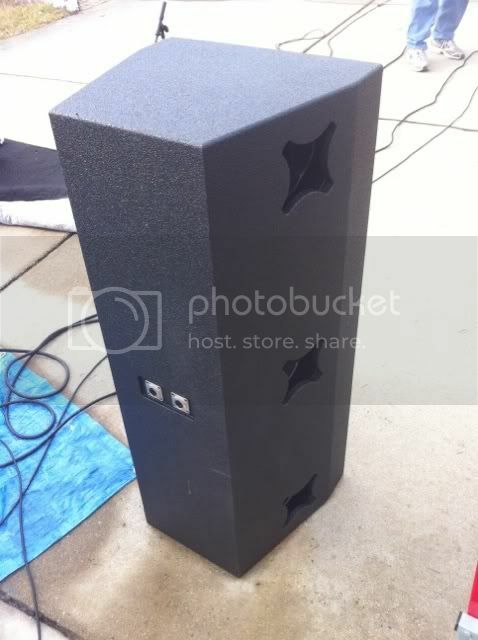 They are good sounding subs with a good amount of output(I imagine a block of 4 would be very impressive). Did you try the subs clustered, or only singly? Due to time restraints and freezing temperatures, we never got around to doing both subs. I couldn't agree more on the looks of the sub, it really does need a full grill. I am just curious if it is the music source that was making the high end break up the way you describe. I wonder why a 2" throat was not used in the Tripple 12, I had a pair of PAS FT1.2 cabs that had a 12" coaxial design with a 2" throat and I thought those cabs sounded fantastic, especially with vocal reproduction. When we were running the 12x and OS at high volume, do you think part of the problem was running out of power? We had both amps and an electric radiator on one 20 amp circuit. I think I'm going to have to live with the 12x for a while to get a better feel for them. The cabinets do stay pretty clean and pretty smooth as you crank them up, but the HF struggles as you approach limit on the IT4000. There is definitely something wrong with your measurements. The Triple 12X is flat to 20khz. That +4db shelf is causing you to reach the compression drivers limits early. I would remove that filter immediately. By the way, the 2011 models now come with a BMS compression driver. Also, I'm in the process of making grills for the Orbit Shifter. Judging by the pictures, I would guess the microphone is far enough off axis from the coaxial driver on top to be out of the VHF pattern. Coaxial drivers like that are quite beamy above 8kHz! I measured the horn on axis @ 1m, and ground plane at 1 & 2m. The measurements were all consistent. It's not the mic, as it showed the EV and Mackie boxes flatter out to 16k. The only time the amp affected the sound was when it shut down due to low voltage. I haven't used SMAART myself, so I am not conversant with the displays shown (I saw the 0dB in the display), but were the measurements taken at full power on the IT4000 or at 1w or some other power? I say this because the speakers IIRC are rated at 1600w program which means that if they were being given the full 2000w the IT4000 is capable of at 4ohms and had a 4db HF eq boost applied, the HF would be pushed well beyond it's comfort zone. I would expect most lesser speakers to be screaming for mercy or completely giving up the fight. Also, is it possible that the coaxial MF/HF was mounted in the centre position (it is a sealed unit so can be moved quite easily from what I have read elsewhere) and the measurements were inadvertently not taken on axis at all? I measured the horn on axis @ 1m, and ground plane at 1 & 2m. Following up on Jon's and Trevor's suggestions, when you did the ground plane measurements, how many degrees off the axis of the coax CD was the mic when at 1m and when at 2m?